When residents and business owners lodge complaints about the shortage of available street parking, their grievances filter down to the Washington, DC, Department of Transportation (DDOT). Managing the intense demand for parking and curbside spaces in this urban core is complex and requires understanding the current parking supply, as well as the prevailing management plan. Knowing the locations of parking meters, restricted parking zones, parking spots, and signs is a critical part of improving the availability of Washington's limited curb space. Whereas DDOT staff used to have to walk the streets and alleyways in the district to count parking spaces, correct parking meter locations, and inventory street signs, this can now all be done from DDOT's offices. 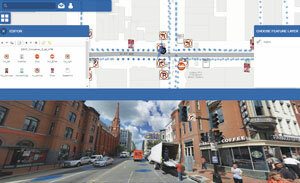 By integrating the ArcGIS platform with high-resolution, highly accurate ground-based imagery, DDOT staff can see what's happening on the ground from their computers. In late 2014, Benito O. Pérez, DDOT's parking/curbside management and operations planner, began a project to gain adequate information on parking availability. Using ArcGIS Online and imagery from Esri partner CycloMedia Technology, Inc., Pérez developed a workflow to audit curbside parking restrictions and inventory off-street parking. "Esri-integrated images from CycloMedia allow us to augment our desktop analysis with a snapshot of reality, which, in turn, streamlines data validation when we do go out in the field," said Pérez. From this, DDOT came up with web maps that showed curb uses and parking availability throughout Washington's most crowded areas. 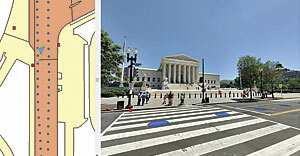 What's more, these maps could be shared with stakeholders to give them a clear picture of the parking situation. For Georgetown, for example, DDOT combined the data in the web maps with other information—such as vehicle registrations and the number of residential permits that have been issued—to show the accurate count of parking spaces and the total number of permit holders in that zone. This allowed DDOT to compare local supply with local demand and determine the number of parking spots left for nonresidents. To obtain an accurate inventory of street signs, Pérez enlisted the help of James Graham, a GIS and applications manager in the DDOT office of information technology and innovation, to complete a street sign database using CycloMedia's Street Smart app for ArcGIS, which works in ArcGIS Online. 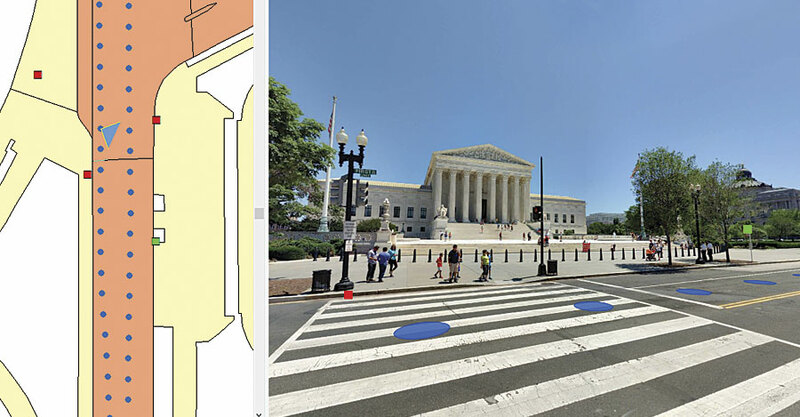 Staff at DDOT have found that using CycloMedia's panoramic imagery in conjunction with ArcGIS Online has considerably enhanced workflows in the field operations division. In the past, sign crews sometimes found that they were sent to the wrong location to do a sign check, or when they were installing new signs, encountered conditions in the field that diverged from what they had anticipated. "With the [GeoCyclorama] data, staff can perform a detailed prework field inspection, letting them know exactly where to go and exactly what to do once they get there," said Graham. For more information, email DDOT's GIS and applications manager, James Graham, GISP.